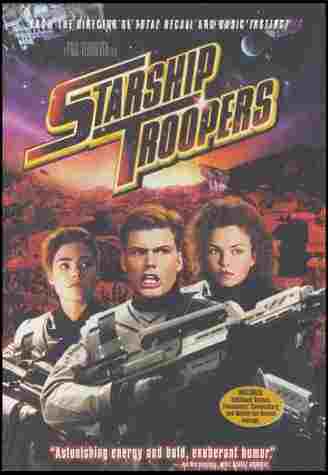 starship troopers movie review, starship trooper film, merchandise, soundtrack. In the future the Earth lives under a military run government. Schools are set up to churn out soldiers and thoses loyal to the governments causes. Such are deemed "citizens" To gain citizenship many join the Mobile Infantry, the standing army unit of notority in this day. Training is brutal, surrender is never an option. A great alien attack on the Earth has been going on for many years now. The "bugs" as they are known hurl their spores across the cosmos and when they strike the Earth great devastation follows. The Mobile Infantry is finally dispatched to the home world of the bugs in an attempt to eradicate them. They are landed with no ground vehicles, no artillery, and no heavy weaponry. This is very illogical from a military point of view. In addition thousands of spaceships circle above the planet so close that they ultimately crash into each other. But the strength of the movie is in the mobile infantry and its battles. Bugs the size of cars storm a mobile infantry base. Fighting is within inches of the massive beasts. Machine guns hurl out bullets as fast as they can but it isn't enough. Two and three soldiers shoot down bugs as they get within inches of them. This makes for a very impressive tooth and nail approach to warfare. The movie ends with humanity gaining the means technologically to destroy the enemy, and the audience withnesses what is to be interpreted as a slow human advance to victory. The movie placed Neil Patrick Harris of Doogie Howser fame into the position of being a prominent scientist. His role proved laughable from the beginning. The film shows how recruits fare in the armed forces of the Earth. The mobile infantry is the focus, but the air force is also prominent, and flyers and grunts get into many brawls. One word describes the film and thats action. The film has humor, the film has effects, but most of all it has action. The film even uses almost middle ages tactics in an attempt to allow for even more up close combat. Webpage text, design and layout are Copyright © 1995-2007 movieprop.com and Mark Crawley. All Rights Reserved.